Alle media hebben het op dit ogenblik over de tentoonstelling van Michael Borremans in Bozar. Terecht, Borremans is een toptalent, die tot de echte wereldtop behoort. Maar soms is het ook eens leuk om binnen te lopen in een totaal onbekende tentoonstelling. 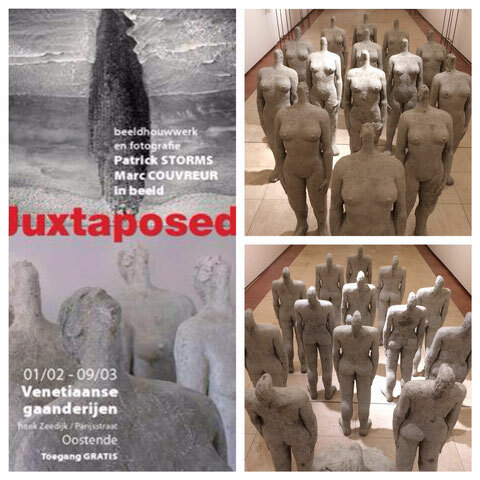 Dat deed ik vandaag in Oostende waar de expo 'Juxtaposed' loopt. Patrick Storms wordt er geconfronteerd met Marc Couvreur. Beelden naast foto's. 3D tegenover 2D. Ik heb er alvast van genoten. Opvallend was trouwens ook de kracht van de titels van de werken die soms verrassend, vaak verhelderend waren. Treffend. Weeral bijgeleerd, zoals bij elke ervaring. Loop zeker eens binnen, nog tot 9 maart. you are really a excellent webmaster. The website loading pace is amazing. It kind of feels that you are doing any unique trick. In addition, The contents are masterwork. you have done a excellent job on this topic! Quality articles is the main to interest the people to go to see the site, that's what this site is providing. It is the best time to make some plans for the future and it is time to be happy. I've read this post and if I could I wish to suggest you few interesting things or advice. Perhaps you could write next articles referring to this article. I desire to read more things about it! Hey there would you mind sharing which blog platform you're working with? I'm looking to start my own blog in the near future but I'm having a tough time making a decision between BlogEngine/Wordpress/B2evolution and Drupal. The reason I ask is because your design and style seems different then most blogs and I'm looking for something unique. P.S Apologies for being off-topic but I had to ask! Wow, that's what I was looking for, what a data! present here at this website, thanks admin of this website. Hi it's me, I am also visiting this site regularly, this web site is in fact fastidious and the people are genuinely sharing fastidious thoughts.